I love my rotisserie. It turns out better roasts than any other method I’ve tried. Get it? Turns? Thank you, thank you, I’ll be here all week. There is some extra work involved with rotisserie grilling - you can’t just slap the meat on the grill - but it’s worth it. Here is my eleven step program to using the rotisserie attachment for your grill. 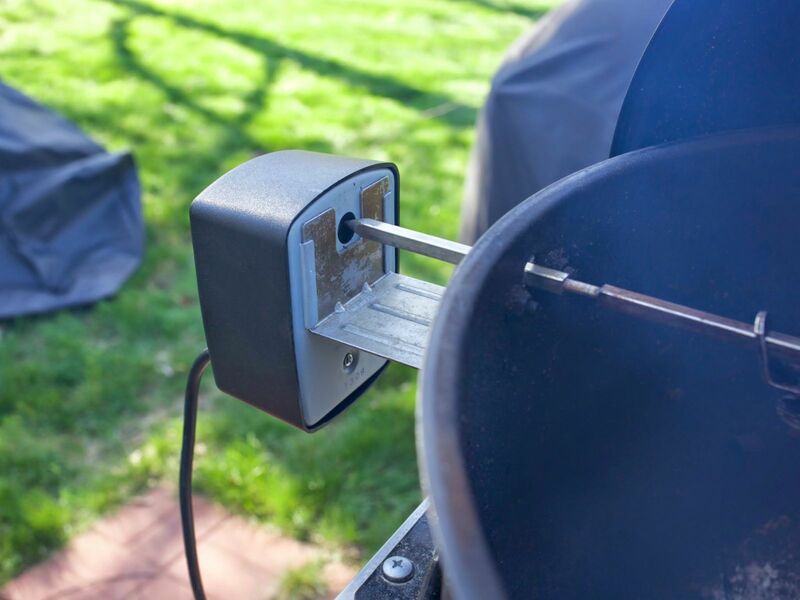 A grill with a rotisserie attachment (spit, spit forks, motor, and motor mount (which is attached to the rotisserie ring if you bought the Weber kettle rotisserie). No matter what meat you’re cooking, it is a good idea to truss it first. The rotisserie turns gently, but as the meat cooks, that gentle turning will tear the roast loose if it is not securely tied down. Secure the meat to the spit with the spit forks - push them in there tight. Again, you don’t want anything wobbling around. 3. Set the grill up for indirect heat, with a drip pan in the middle, between the lit burners or the coals. On a charcoal grill, light the coals, then pour them into two piles on the sides of the grill. (If your grill has charcoal baskets, they’re perfect for this.) Set the drip pan on the charcoal grate between the piles of charcoal. 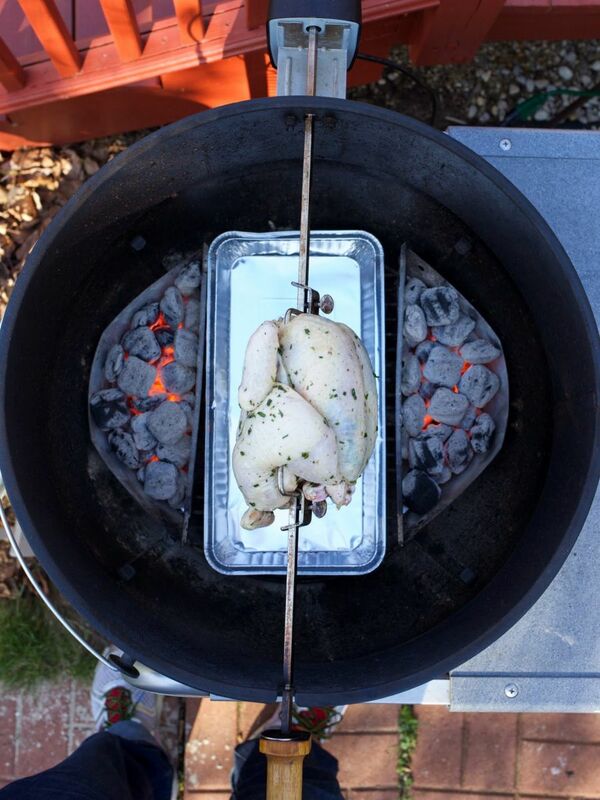 Next, put the rotisserie ring on the grill and make sure it is seated. No matter what you are to cooking, use with indirect medium-low heat and the temperature should stay right around 350F. Slide the rotisserie motor onto the mounting bracket, plug it in, and turn the motor on and off to make sure it is working. 5. Open the lid on the grill. Do this now, before you go pick up the spit - you don’t want to be fumbling with a yard long metal spear with a heavy roast in the middle with one hand, while you try to open the lid with the other hand. What about the counterweight? Some gas grills and older kettle grill rotisserie attachments might have come with a counterweight; I ignore it unless I’m cooking something huge, like a 20 pound turkey. Then, I remove the motor from the mounting bracket and set the spit in the grooves on the rotisserie ring. I let the spit go, gravity takes over, and the spit ends up with the heaviest part of the roast facing down. I attach the counterweight to the end of the spit pointing straight up - voila, balanced! Slide the spit out, remount the motor, plug the spit in, and go. 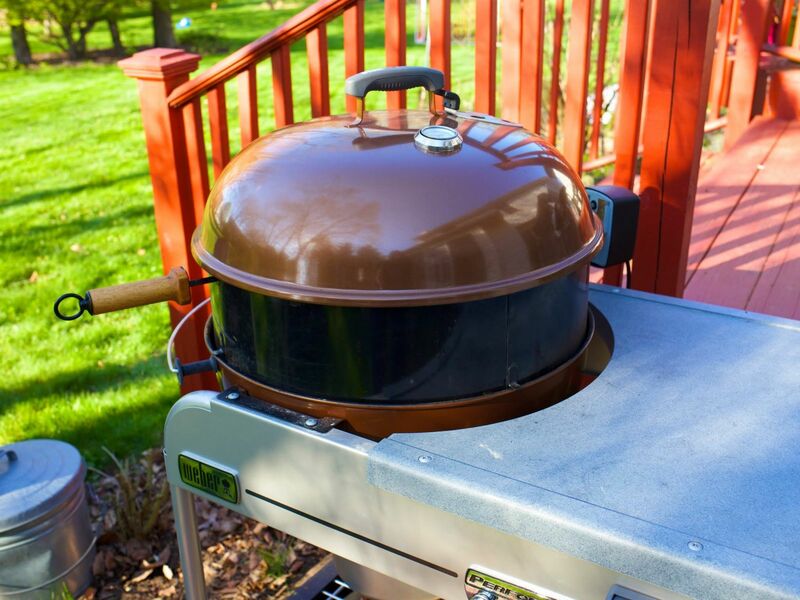 Make sure the spit is turning freely, the meat is secure, and the drip pan is centered below the meat. If the meat is loose or wobbly, stop the motor, loop some twine around the meat, and tie it down tight. Better to tie it down it now than find it ripped loose from the spit forks later. Again, not that that’s ever happened to me. Ever. Nope, not even that one time I…um, I mean…nope, never happened. 9. 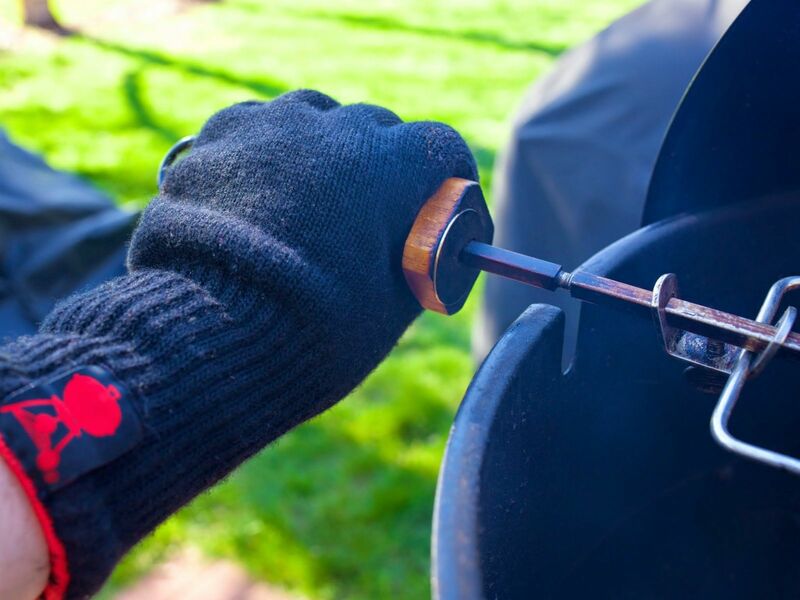 Using the heat safe gloves, remove the spit from the grill and transfer it to a carving board. Be careful - the spit is a branding iron when it first comes off the grill. Let the meat rest for ten to fifteen minutes, then carve and serve the crispest, most crackling roast you’ve ever cooked. I hope this inspires you to put a spin on your next grilling session! Adapted from my cookbook, Rotisserie Grilling. If you enjoyed this post, stop by and visit me at DadCooksDinner.com.